Thanksgiving greeting cards often utilize fall colors. 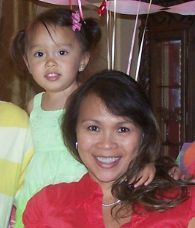 Brown, oranges and yellows dominate the color pallette as with my happy Thanksgiving cards. You'll find plenty of cute stickers with turkeys and pumpkins. Some elaborate and some simple. since there are several stickers on a sheet, you can make lots of cards with one sheet. If you'd prefer to use a different kind of sticker other than a turkey, try an apple, pumpkin or even a scarecrow. That's what I did with my handmade thanksgiving card. I used a turkey sticker so there's plenty left for my other paper card making projects. The turkey sticker didn't have any gems on it but I thought it would dress it up a little bit and would also tie in with the gems on the upper left corner. For many of my handmade card making projects, I use clear labels to print out my sentiment. You have to be careful, though. Sometimes on darker paper, you can see the label more. If you'd prefer to stamp your sentiment, use a small stamp or you can stamp it in the area above the bow for larger stamps. You can also use rub-on letters if you'd prefer. My thanksgiving day card was created from a paper stack of autumn colors. The corresponding colors I used are a lighter and darker brown. 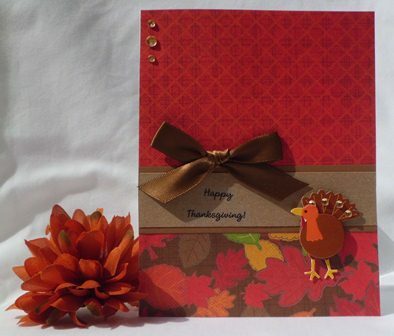 Here are more examples of handmade cards to make thanksgiving day cards. Like I had mentioned, you can use a sticker for several cards when you buy a pack of seasonal stickers. For this Thanksgiving greeting card, I picked a sunflower and a small, green sticker that said "Happy Fall". I guess it's more a fall theme but you can substitute the sunflower with a turkey or pumpkin sticker. 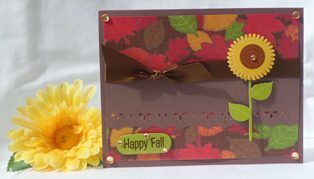 Homemade greeting cards ideas can be endless when making a Thanksgiving card. Just have fun with whatever materials you have. Stick with the fall colors and Thanksgiving stickers and you're all set.